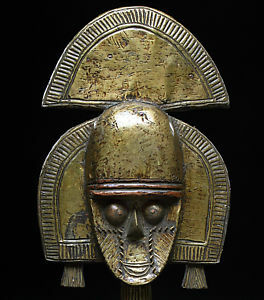 Types of Art: The Urhobo produce numerous art forms, including freestanding sculptures (Ivwri), a type of wooden sculpture that is popularly associated with the cult of the hand, and masks and masquerading. History: Although the exact origin of the Urhobo peoples is not known, they are closely related to their immediate neighbors based on linguistic and cultural similarities. Urhobo oral history is contradictory in that it claims that their origins are related those of the Bini, but at the same time indicate that they are not Bini people. Other connections are made to the Igbo, Isoko, and Ijo. Since the Bini, Igbo, and Ijo all have cultural systems, which are distinct from one another, the notion that the Urhobo somehow emerged from all three seems doubtful. Economy: Living in the tropical rain forests has helped to shape the economic choices of the Urhobo. They practice slash and burn farming that requires frequent crop rotation for soil preservation. Fishing and hunting are also important sources for subsistence. They also gather palm nuts and process them into oil, a commodity which is eventually traded on the international markets. Political Systems: Urhobo political authority is based on kinship groups, age-grades, and title associations. At one time Urhobo leaders (ivie) were officially installed by the Oba of Benin. Those who had achieved sufficient status within their community would travel to the Oba, who would endow them with ceremonial swords and insignia that would add weight to their quest for power among their kinspeople. Religion: The Urhobo recognize the existence of a dual cosmological system: the spirit world and the physical world. It is believed that everyone in the physical world has a replica in the spiritual world and that these two worlds have great influence over one another. Power, however, seems to be in the hands of the spirits, who are constantly making demands on and causing problems for the living, who in turn must appease the spirits through sacrifice. Every ten years the Urhobo hold a large masquerade ceremony for the entire community to honor the spirits (edjo).